But at 2.5 years old, H is now totally on to me. ‘Me ice-cream mummy’. My trick is up! I’m still trying to avoid sugar as much as possible, particularly before bed, so I was inspired to come up with a healthy alternative (for both of us), that tasted great and was smooth, creamy and of course delicious. This avocado lime ice cream is just that (also approved by a non avocado fan), so I’m sure you and any suspicious children will agree. When you are done hang on to the avocado seed and grow a tree from it on your kitchen bench, the kids will love watching it grow. My instructions are below. 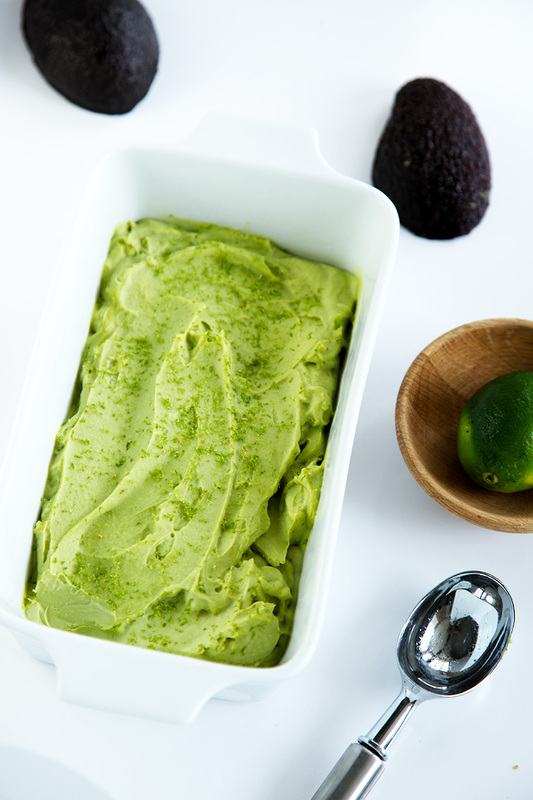 Remove the flesh from the avocado and place in a blender with all the other ingredients; blend until smooth. Taste and adjust sweetness to suit. I found it it tasted sweeter the next day so don't over sweeten. Churn in an ice cream maker as per your machines instructions. Add to a freezer proof dish and sprinkle with the lime zest. Serve as a soft serve or freeze until you are ready to use. This ice cream freezes really well and doesn't get super hard - the perfect consistency. 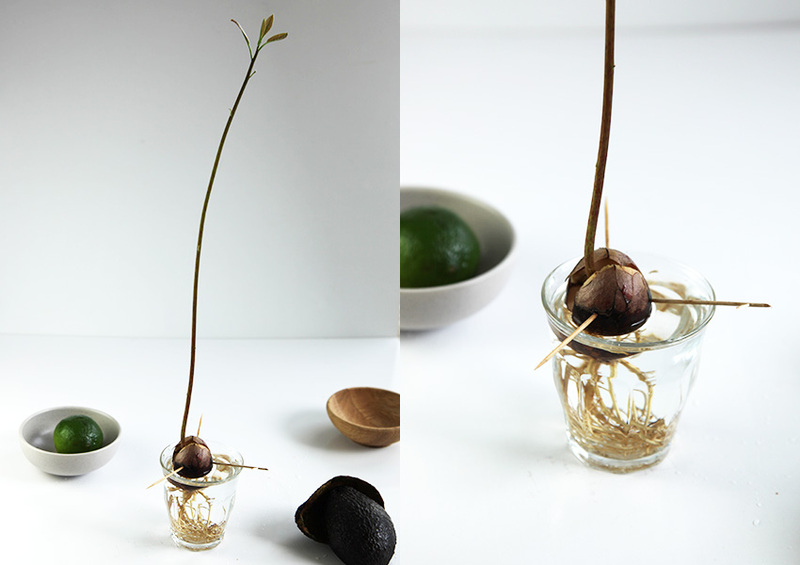 Keep the seed and make an avocado tree from it. See my instructions below. The kids will love watching it grow. 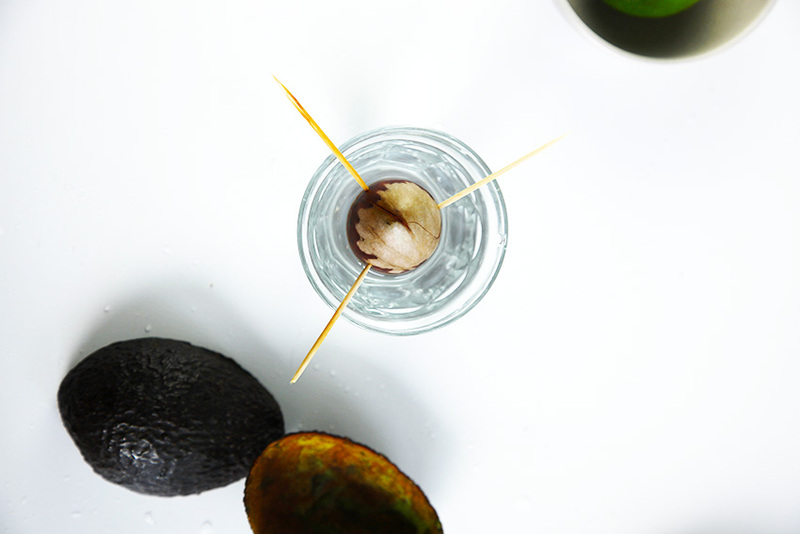 To grow an avocado tree from your seed all you will need is: a seed, 3 toothpicks, a glass of water. The pointy end of the seed should face up. Push the toothpick into the seed so you can suspend it over a glass of water. Don’t let the seed dry out, water well, the seed should be partly submerged. After a few weeks you will notice roots sprout and a few more weeks a stem and eventually leaves. H has loved watching it grow. It’s almost time for us to plant it outside. We have another three growing on our kitchen bench now. This ice cream looks amazing. I love avocado and lime together. I’m really excited to make this for my family 😃 pinning for later. When I saw this, I was like PIN! It looks SO good, smooth and creamy, Ah! Thank you for this one! What a great recipe. I have a 13 month old that loves ice cream but I always am thinking about the sugar. Thanks for sharing and I look forward to trying this soon. Thanks so much Simon, yes definitely give it a go. I’d love to know what you think. It is very yummy and a huge bonus that it is actually good for you! Thank you so much Lynn, the colour is gorgeous isn’t it! Grow an avocado tree on your bench and you may have one in a few years! Such a unique idea! I made desserts with avocado, but I’ve never even thought of using it in ice cream. The colour is brillian! Thanks so much Julia, yes I was thinking that it may be a little weird but it isn’t at all. Quite delicious in fact. 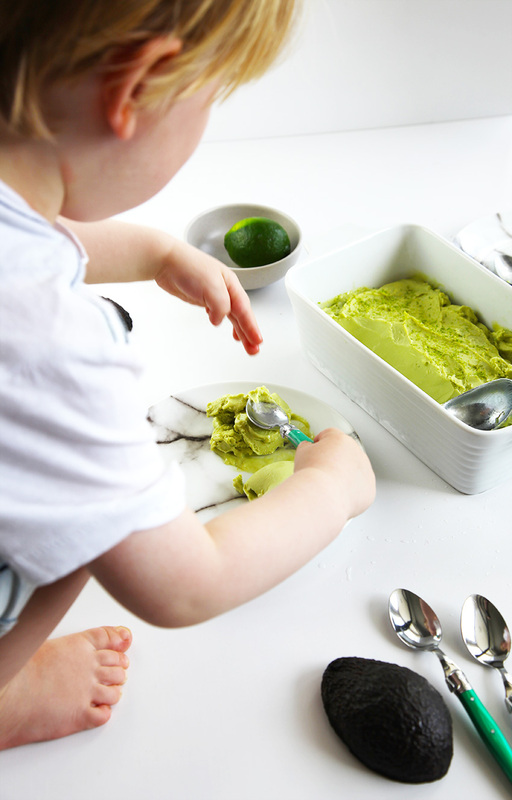 Looove avocado anything especially this awesome vibrant colored ice cream! And LOVE that you are growing an Avocado tree! This is so random and coincidental that I came across your blog today for the first time from the FBC FB group and just yesterday I received an email from a company with a gadget for growing your own avocado tree and they kept referencing how it was so much easier the toothpick method – which I had never even heard of, so it’s funny that today with your blog I just saw that you’re doing the toothpick method. Anyway lol sorry for the long rambling comment! I don’t even own an ice-cream maker but I want to get one just to make this! I can imagine the taste already! 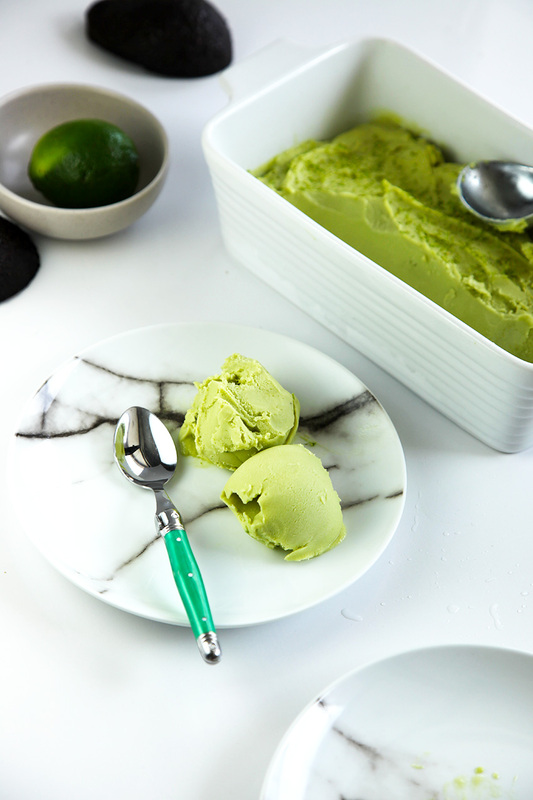 I wanted to make avocado ice cream over the summer but I didn’t really have time to try all my recipes on the list. Looks yummy! They look so creamy, I am on my way for some avocados! They’re amazing, healthy and you can use them to make sweet or savory dishes… Either way delicious! Wow! I love avocado. Thanks for sharing the recipe. Hi Tiffany, I do but I don’t think it’s super important. I mostly do it so it looks nice sitting on my bench. Wow Joleen, I’m intrigued now, how do you dye with them? I hope you enjoy the ice-cream. I love it..
Hello! it is possible to make it just with a blender? :) I don´t have a icecream machine! Growing from the avocado seed. I think its big enough to plant in a pot. Its too cold to plant outside. How big does it get? How big of a pot should I use?